VLADIVOSTOK, August 30. /TASS/. 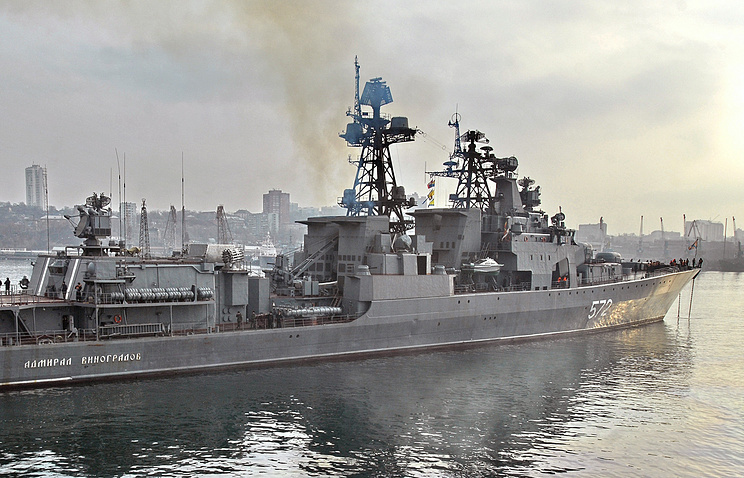 A detachment of ships of Russia’s Pacific Fleet is expected to make a voyage to the South China Sea at the beginning of September, the chief press officer of Eastern Military District for the Pacific Fleet, Captain 2nd Rank Vladimir Matveyev told TASS. The ships will take part in a major naval exercise of the Chinese Naval Force codenamed Joint Sea 2016. "At the beginning of September, a detachment consisting of the big antisubmarine ships Admiral Tributs and Admiral Vinogradov, the big amphibious ship Peresvet, the sea towboat Alatau, and the tanker Pechenga will head for Zhanjiang in China," Capt. Matveyev said. "From September 11 through to September 19, the ship crew will take part in the Joint Sea 2016 wargames of the Chinese Naval Force that will be held on the coast and in the water area of the South China Sea," he said. The crews of the ships have coordinated the various aspects of joint maneuvering, anti-subversion, antisubmarine, antiaircraft, and anti-ship defense and have done preparatory artillery firing at aerial and sea-based targets, Capt. Matveyev said. He indicated that this is the fifth time Russian and Chinese navies hold this regular exercise aimed at consolidating practical cooperation and counteraction to various threats out in the sea. In 2015, the wargames were held in the Sea of Japan.